Dobrich (Bulgarian: Добрич) is the eight most populated city in Bulgaria, the administrative centre of Dobrich Province and the capital of the region of Southern Dobrudzha. It is located in the northeastern part of the country, 30 km west of the Bulgarian Black Sea Coast, not far from resorts such as Albena, Balchik, and Golden Sands. In January 2012, Dobrich was inhabited by 90,375 people within the city limits, while along with the legally affiliated adjacent villages the population was 112,203 inhabitants. The city is named after the Bulgarian medieval lord of the surrounding region - Dobrotitsa. Agriculture is the most developed branch of the economy. 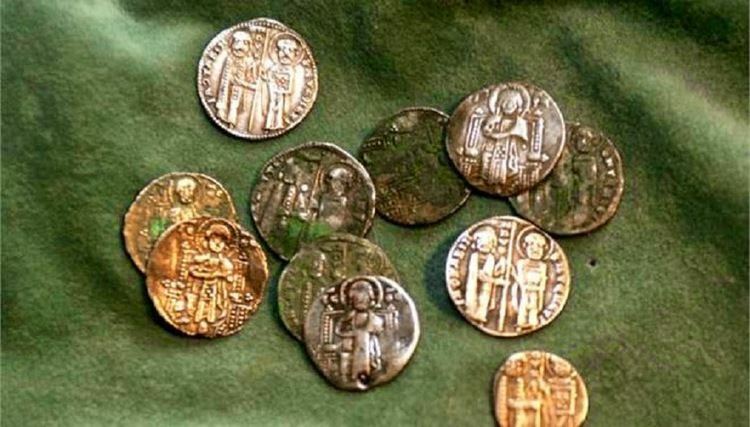 The city is named after the 14th-century Dobrujan ruler Dobrotitsa, from the Slavic root dobr, "good"
The first evidence of settlement in what is now Dobrich dates from the 4th or 3rd century BC. Under the Latin name Abrittum, it was a city of the Roman province of Moesia Inferior, important enough to become a suffragan bishopric of the Metropolitan of the capital, Marcianopolis, but the Catholic diocese faded later. 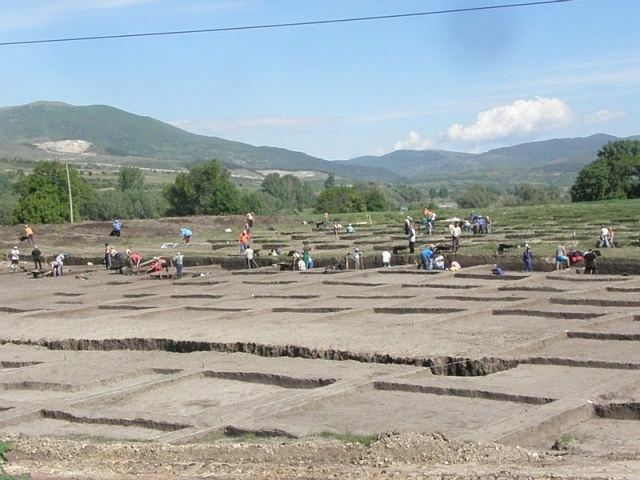 Ruins from 2nd to 4th centuries AD and the 7th to 11th centuries have also been found, including a Bulgar necropolis featuring pagan graves in the centre of the city. After the Treaty of Bucharest of 1913 (confirmed by the Treaty of Neuilly of 1919), Dobrich and the whole of Southern Dobruja were incorporated in Romania for a period until 1940. 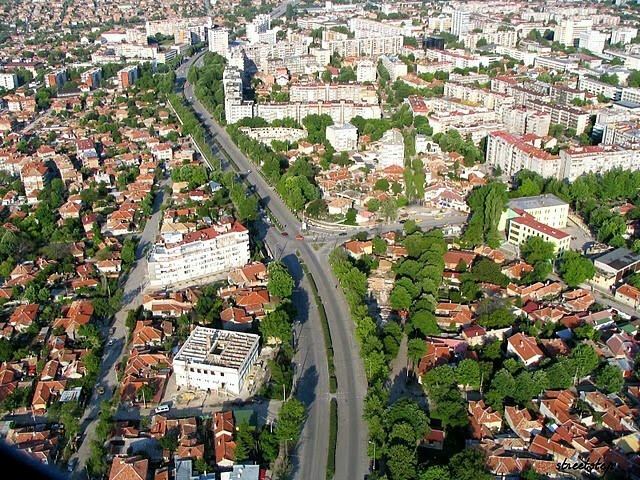 During that time, the city bore the name Bazargic, which is a transformation of the earlier Turkish name Hacıoğlu Pazarcık, and was centre of Caliacra County (județ in Romanian). On 25 September 1940, the Bulgarian army marched into the city after signing Treaty of Craiova on September 7, 1940; date celebrated as the city's holiday, later changed to September 25. In 1949, during the period of Communist rule, Dobrich was renamed Tolbukhin (Толбухин) after Marshal of the Soviet Union Fyodor Tolbukhin. On 19 September 1990, a presidential decree restored the city's old name of Dobrich. Despite the renewing of the name Dobrich architecturally maintains an ex-communist outlook even in the 21st century. The vehicle registration plate code for the region has also remained unchanged. It is the abbreviation TX (from ТолбуХин; Тolbukhin). The diocese was nominally restored as a Latin titular bishopric, initially under the name 'Abrytus (Abryus in 19922-24), changed to Abrittum in 1925. Surface water resources are insufficient in the region. The town is supplied with water from drill wells and water catchment areas located near the town. Eight pumping stations provide bacteria-free drinking water which does not even need further treatment. The water sources are in constant operation. A security area surrounds each source, and the water distribution is controlled by computers. The municipality boasts a complete water supply network. Agriculture is the most developed branch of the economy. The main reason for this is the environment – climate, soils and clean lands. 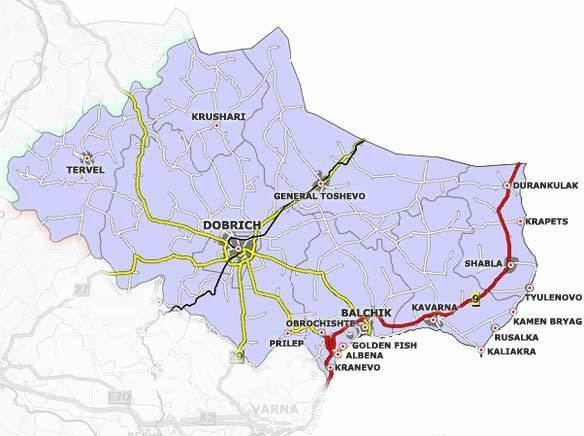 81% of all the land in Dobrich is agricultural, almost 4,000,000 decares. More than 70% of it is cultivated, which makes Dobrich №1 cultivated region in the country. Farming, plant-growing and stock-breeding are the most important part of the economy in Dobrich. Dobrudja territory, called the “granary of Bulgaria” is part of the district. Some of the end products made in Dobrich are: bread and flour products, all kinds of sausages, milk and dairy products, poultry products, margarine and vegetable oils, wine, soft drinks. The biggest bird-farm is located in the district. Other factories of great importance are the milk factory (one of the biggest factories in Bulgaria), the bread factory (one of the biggest factories in Bulgaria). Additional important products from other industries are cement, electric appliances, clothes, confection, furniture, car batteries, containers and there are many other factories from the food and beverage industry. In January 2012, Dobrich was inhabited by 90 375 people within the city limits, while along with the legally affiliated adjacent villages the population was 112 203 inhabitants. The number of the residents of the city (not the municipality) reached its peak in the period 1986-1991 when exceeded 110,000. The following table presents the change of the population after 1887. Ahmed III, Ottoman Sultan during the Tulip period, who was born in Dobrich at the year 1673.